in 360i News, Creative & Tech with tags Game of Thrones, oreo Both comments and trackbacks are closed. Send a raven! 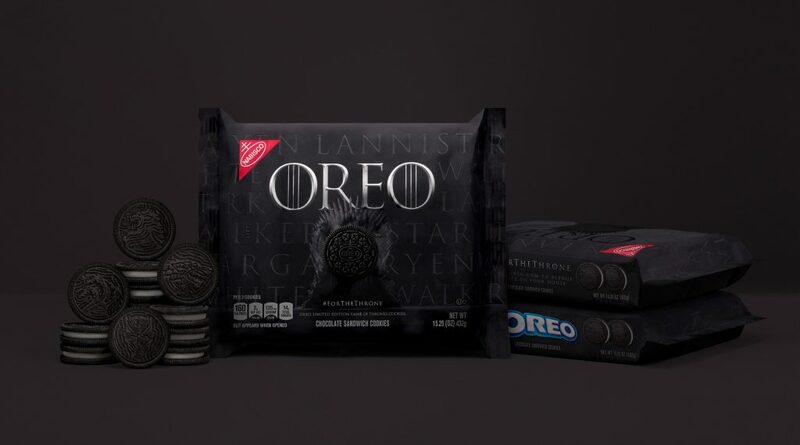 OREO and HBO are bringing fans the mother of all TV watching snacks—OREO Game of Thrones cookies—thanks to a new alliance conceived of and executed by agency partner 360i. A tasty tribute to the final season of Game of Thrones, the new limited edition OREO cookies feature four unique embossments that spotlight both the iconic sigils of the three Great Houses still battling for the Iron Throne, as well as the enemy White Walkers beyond the wall. The collaborative effort delivers a playful new take on the original cookie, with each pack featuring four unique embossments on top of the chocolate wafers that represent: House Lannister, House Targaryen, House Stark and The Night King. Throughout the season, OREO is encouraging fans to pledge their fealty for House Lannister, House Targaryen, House Stark, or The Night King by visiting oreo.com and OREO’s Facebook and Twitter channels. Select engaging fans could be surprised throughout the season with a special treat for pledging their chosen house. Follow the conversation on social using hashtags #GameOfCookies and #ForTheThrone. To celebrate this momentous collaboration, 360i creatives teamed with Elastic—the design studio behind the original Game of Thrones opening sequence—to create an all-OREO version of the show’s iconic opening credits. The film showcases the houses still in play for the throne with an animated landscape built entirely out of OREO cookies. Featuring more than 2,750 animated original and OREO Game of Thrones cookies, the land, forts and towers are all made out of the cookie base, while lakes and rivers are represented by the beloved OREO creme. OREO Game of Thrones is expected to be one of the brand’s largest Limited Editions ever. OREO Game of Thrones cookies are available for a limited time starting April 8, nationwide wherever OREO cookies are sold, while supplies last.